Comment 2: How do we know the tyrannosaur came from Mongolia? (and the related question, which I’ve decided to lump with this one: Why does the auction company, and subsequent news stories, refer to the specimen as Tyrannosaurus bataar while palaeontologists call it Tarbosaurus? The first thing we need to address with these questions is the concept of ‘species’. In high school, most of us will have learned that a species is defined as a group of interbreeding individuals that can produce fertile offspring. This is called the Biological Species Concept. What many people may not know is that this is just one of many species concepts. Palaeontologists can’t go back in time to check on which dinosaurs were interbreeding, so the biological species concept can’t really be used in palaeontology. Instead, we generally use the Morphological Species Concept, which essentially boils down to ‘a species is a group of individuals that look like each other and not like others’. 1. Changes that occur during growth: An older individual of the same species can look different from a younger one. 2. Sexual dimorphism: Males and females of the same species may look different. 3. Normal individual variation: Individuals within a species can look different from each other because of normal variation resulting from small genetic differences and environmental differences. As an example, think about all the different dog breeds there are today. 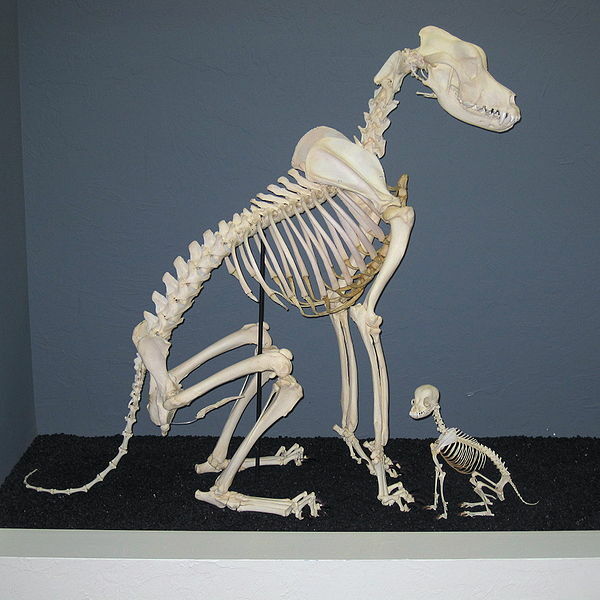 All dogs can interbreed (theoretically, although surely a Great Dane crossed with a Chihuahua must be pushing the limits of what is practical…) and produce fertile offspring, and belong to the same species, Canisfamiliaris. On top of that, all dogs are descended from domesticated grey wolves, and so many scientists regard them as a subset of the species Canis lupus. In taxonomic terms, this is called a subspecies, and we would write it as Canis lupus familiaris. 4. Changes that occur during fossilization (‘taphonomy’): Most fossils preserve only the skeleton, and so information from soft tissues like colour, integument, and muscles is lost. Skeletons become disarticulated, and individual bones get broken. All of this reduces the amount of information we have to work with. Finally, the remaining bones can become squished and distorted because of the extreme forces that occur as rocks form. 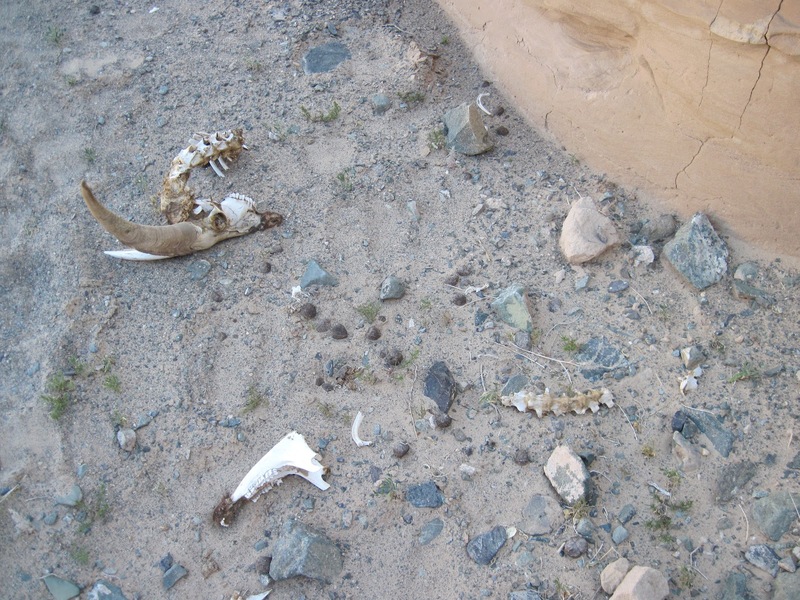 Disarticulated Argali sheep skeleton in Mongolia, 2010. Finally, it is important to remember that the natural world doesn’t always fit into discrete categories, and that the concept of species, genus, etc. is something that humans have created to help sort living things into workable categories. How many differences do two populations need to have in order to call them different species? How many differences until we split things into different genera? There isn’t really an answer to those questions, and so deciding on what are ‘species-level’ differences vs. ‘genus-level’ differences is the source of much debate. But that’s ok, because that is a big part of what is fun about taxonomy and palaeontology! So, moving on to Tyrannosaurus rex vs. Tyrannosaurus bataarvs. Tarbosaurus bataar. Tarbosaurus bataar and Tyrannosaurus rex have several morphological differences in the skull, but these are not necessarily obvious if you’re not accustomed to anatomical terminology or used to looking at skulls. Nevertheless, they are present, and there is an excellent, free to access paper in Acta Palaeontologica Polonica that you can go download right now to see for yourself. In a nutshell, the skull of Tarbosaurus is narrower than Tyrannosaurus when you look at it front on, and the nasal bones (the bones along the top of the snout) are domed near the front of the eyes. Additionally, the arms of Tarbosaurus are proportionately even shorter relative to the rest of the body than those of Tyrannosaurus, which are already pretty short. 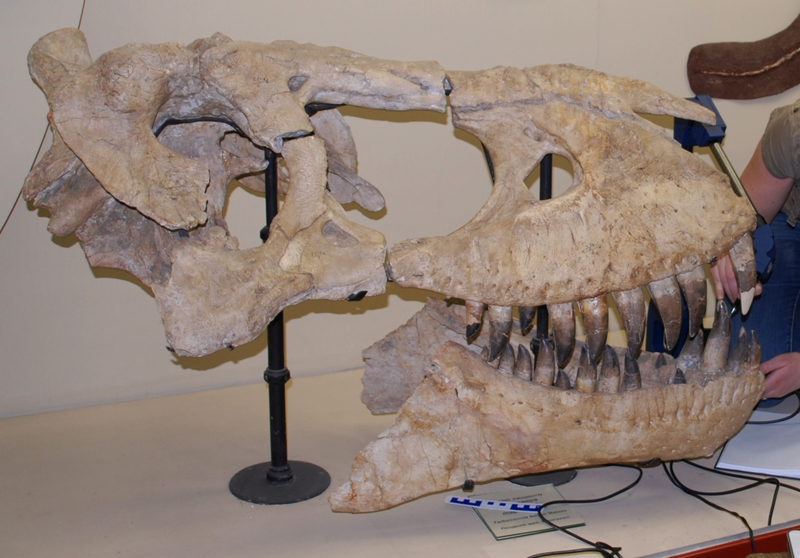 Tarbosaurus bataar partial skull at the Palaeontological Institute in Moscow. Tyrannosaurus rex skull at the Royal Tyrrell Museum in Drumheller, Alberta. It’s pretty clear that Tarbosaurus bataar and Tyrannosaurusrex represent different species, because these differences are geographically separated. Small-armed, narrow-skull tyrannosaurs are only found in Mongolia, and longer-armed, wider-skull tyrannosaurs are found only in North America. You could make an argument that perhaps the differences are insufficient to warrant having two genera, in which case the genus Tyrannosaurus has priority over Tarbosaurus because it was named first. However, most palaeontologists accept both the genus Tarbosaurus and the genus Tyrannosaurus as being valid. So why did the auction house consistently call their skeleton Tyrannosaurusbataar? I can’t say for sure, but I suspect it is because Tyrannosaurus is much more a household name than Tarbosaurus, and this makes the skeleton more recognizable and interesting. It’s easier to tell someone your skeleton is a Tyrannosaurus than to do what I’ve just done here and explain how there is a similar, but different, tyrannosaur in Mongolia called Tarbosaurus. So, we can look for anatomical features in the skull and skeleton that indicate whether or not the tyrannosaur was a Tarbosaurus or a Tyrannosaurus. But how do we know that the skeleton came from Mongolia? Well, much like certain animals today are found only in certain places, some dinosaurs were found only in some places and not others. Tarbosaurus has so far only been recovered from the Nemegt Formation, a set of rocks that are only known in the Gobi Desert of Mongolia. If the skeleton is shown to be a Tarbosaurus, and not some other species of tyrannosaur, then the conclusion we must come to without any additional information is that the specimen comes from Mongolia. We can also use the colour and preservation of the bones to identify where the skeleton came from, because different rock units will produce differently coloured fossils (in Alberta, dinosaur bones are often brown or black, and in Mongolia, they are often white or reddish). If for some reason there was good evidence that the skeleton did not, in fact, come from Mongolia, that would only make the specimen more scientifically important, as it would extend the geographic or stratigraphic range of the genus Tarbosaurus and would give us important new information about that genus. I had originally hoped to post this second part much sooner, and so much has transpired since my original Tarbosaurus post. I’m particularly pleased to see that a delegation of Mongolians and palaeontologists examined the auctioned Tarbosaurus this week as part of the investigation into the specimen. You can read their report at the Painter Law Firm’s website. I also highly recommend this article at the Guardian by palaeontologist Dave Hone, and many thanks to Brian Switek at Dinosaur Tracking for his kind words about my first post in this series. Hurum JH, Sabath K. 2003. Giant theropod dinosaurs from Asia and North America: skulls of Tarbosaurus bataar and Tyrannosaurus rex compared. Acta Palaeontologica Polonica 48:161-190. 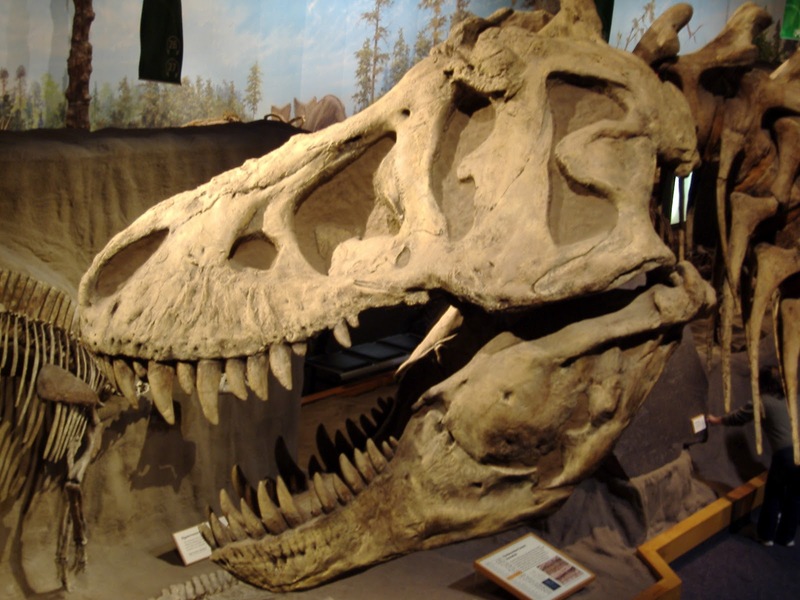 ← Thoughts on Tarbosaurus, Part 1. I'm not sure Tarbosaurus can only be from Mongolia. If memory serves, the Subashi of China has yielded not only Shanshanosaurus–thought to be a juvenile Tarbosaurus–but a fragmentary larger tyrannosaur, which could also be that genus. Scrap from the Amur and nanxiong has also been referred to Tarbosaurus– a wastebasket for post-Baynshirenian asiatic tyrannosaur material–but the age may not be right. I doubt Tarbosaurus was endemic to Mongolia–Tyrannosaurus ranged from Canada to NM, at least–so, conceivably a good specimen might've been found elsewhere. But this is very doubtful; there's a 99.99% chance it's from the Nemegt.